Research on Ice Researchers collect samples from floating sea ice for later analysis in the lab. Elizabeth Shadwick/VIMS. Iceberg A Zodiac carrying Arctic researchers provides scale for an Arctic iceberg. Elizabeth Shadwick/VIMS. When most ships see an ice floe, they flee. Not so the Swedish research vessel Oden, which this August will moor itself to a large slab of floating Arctic ice for a month-long study of one of the major uncertainties in climate-change research—the complex interplay between sea and sky. Joining the international project is a three-member team from William & Mary’s Virginia Institute of Marine Science. Assistant Professor Elizabeth Shadwick, the VIMS lead, will contribute from stateside as she recently returned from maternity leave. Professor Walker Smith and postdoctoral researcher Andrew Margolin will travel aboard the 354-foot icebreaker Oden, which is scheduled to sail north from Svalbard on July 31st. Shadwick says her team’s objective “is to assess how changes in seawater chemistry as a result of increases in atmospheric carbon dioxide will alter interactions between algae and bacteria in sea ice.” The VIMS study is one of 14 projects to be conducted by onboard research teams during the upcoming cruise. Four other teams will be sending sensors to gather data for later analysis. 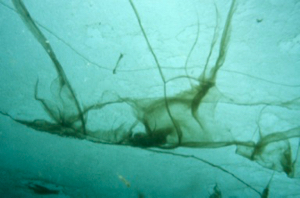 Other project participants hail from Stockholm University and the University of Gothenburg in Sweden; the Alfred Wegener Institute and University of Oldenburg in Germany; the University of Leeds and University College London in the U.K.; and the Bigelow Laboratory for Ocean Sciences, College of Charleston, University of California, University of Michigan, University of Washington, and Villanova University in the U.S. Major funding for the project is provided by the Swedish Polar Research Secretariat, Swedish Research Council, and the U.S. National Science Foundation. 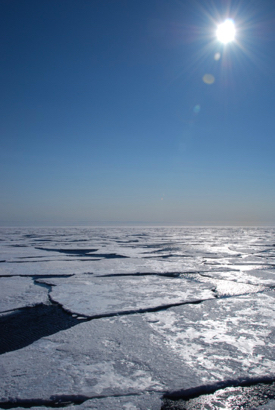 Interactions between clouds, marine communities, ocean chemistry, and climate are inherently complex, and made even more so in polar regions by the presence of sea ice. Adding further complexity is that sea-ice cover in the Arctic Ocean is rapidly decreasing due to global warming. Clouds play a key role in climate change because they can promote both cooling (by reflecting sunlight) and warming (by trapping outgoing heat energy). Which effect predominates depends on cloud abundance, distribution, height, shape, and opacity—features that are themselves changing as Earth warms. 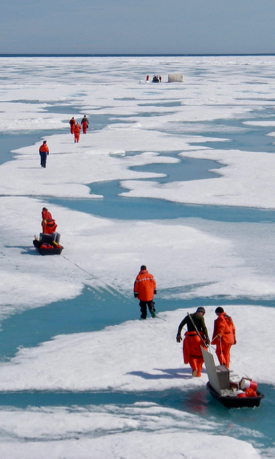 Changes in sea ice present similar complexities. Adding even more complexity is that in order to form, clouds require tiny suspended particles. These “condensation nuclei” can be anything from dust specks to soot from a smokestack or forest fire. Over ocean areas, the major sources of these “cloud seeds” are sulfurous chemicals released by single-celled phytoplankton during photosynthesis and growth. These marine algae, which inhabit sunlit surface waters worldwide, also occur in a less familiar habitat in polar regions—on the surface and inside tiny channels within floating sea ice. Under current conditions, a single species of ice algae—the diatom Melosira arctica—accounts for almost half the primary production of organic matter in the Arctic Ocean. But Dr. Klaus Valentin of the Alfred Wegener Institute warns that “nobody can predict whether Melosira will be a victim or a beneficiary of the melting sea ice.” Valentin, who is not involved in the current study, says "As the sea water gets warmer and the sun gets stronger, most algae grow better, but this may be completely different for the Melosira." One thing that sets Melosira and related ice algae apart is that they build skeletons of silica—largely resistant to the increasing ocean acidity that is already dissolving the shells or skeletons of corals, oysters, and other sea creatures that instead use calcium carbonate. Indeed, the few studies done so far show that increases in ocean CO2 levels actually promote the growth of siliceous diatoms. 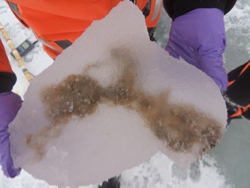 During the upcoming Oden cruise, Smith and Margolin will further test the effects of changing ocean acidity by exposing algae and bacteria collected from nearby ice floes to different concentrations of CO2 dissolved in seawater, and monitoring how it affects the organisms’ metabolism and growth.